Jan Taylor - What happens when 2 different type of gardeners live in the same house & both live in the woods? You make garden areas for 1 to mow around but don”t fill the area because he needs to drive through in the fall to collect the leaves. 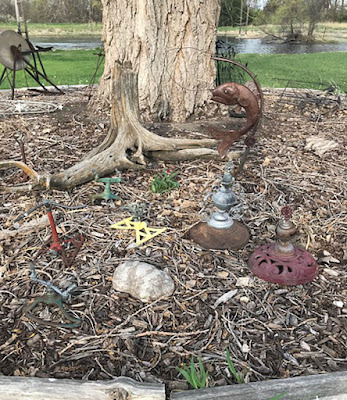 So, yes yard art shows up as that can be moved plus it doesn’t feed the deer. I feel your frustration, Jan. We've replanted so many times I think we're just restocking the buffet for the deer at our house! 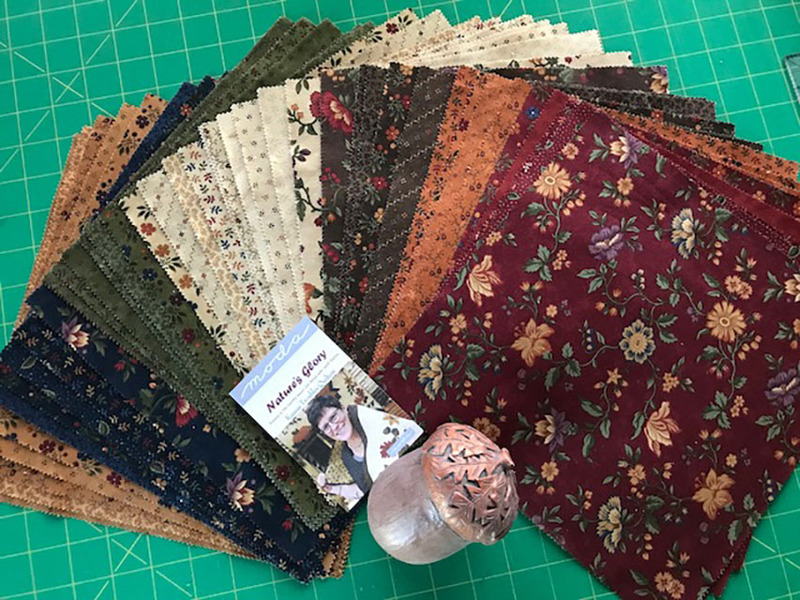 Please email me at lynne@ktquilts.com with your mailing address and Robert will send your Country Road flannel bundle right away. In the past, I've looked forward to the long holiday weekend, visiting with family & friends and relaxing on the porch. I usually help my Mom take flowers to the graves of family members passed - grandparents, great-grandparents and long lost relatives I've only heard stories about. I knew a couple of my grandparents, but I was relatively young when they passed, so it isn't usually an emotional time for me. This year is different. This week marks the first anniversary of my Dad's passing. I plan to take 2 dozen sunflowers to his grave tomorrow, one for each of his kids & grankids. I drive by the cemetery almost every day, but that's not where I feel his presence. We built our little house in the country on the land across the road from where he grew up and learned to drive a tractor. I look out the window each day to see the pond he helped dig as a teenager. He stocked it with fish so his kids and grandkids could cast a line and catch a fish in minutes. 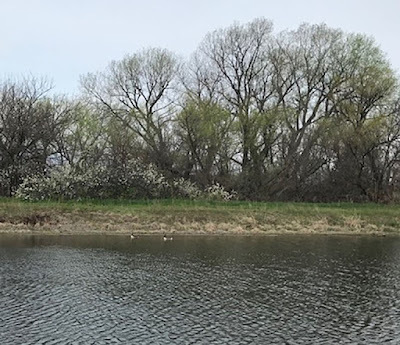 He strolled down our lane every day, walking stick in hand, to feed the fish and linger under the giant cottonwood tree, watching the ducks and geese, surrounded by the place he loved. I don't need to visit the cemetery to be close to my Dad. I am blessed to live at his happy place. Have a wonderful weekend remembering those you miss and keep close to your heart. 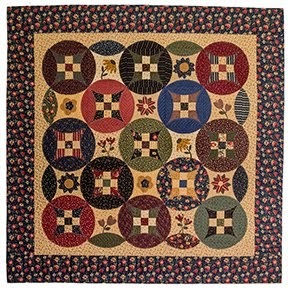 I designed this quilt with my Layered Patchwork technique in mind. 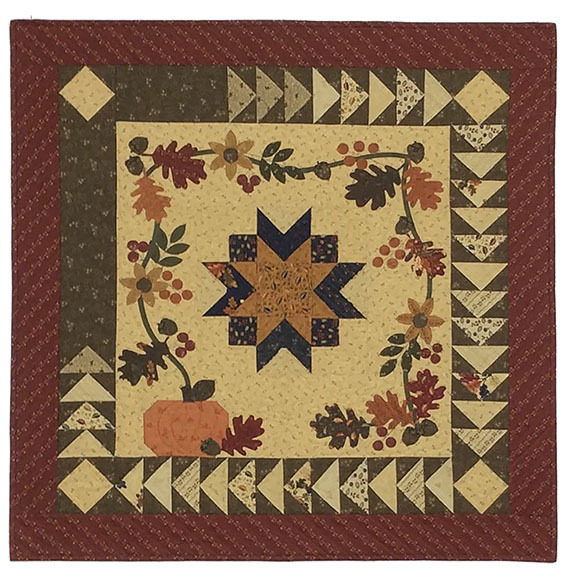 The stars, flying geese and pieced border are all created using a Nature's Glory Layer Cake and my simplified method for easier piecing. Interested? In addition to making this 60"x60" lap quilt, you'll spend a day with Jenny Doan of Missouri Star Quilt Co. learning her unique way of assembling quilt blocks, and a day with Judy Fenton, Baby Lock dealer extraordinaire, creating a wonderful project using all the features of the machine. Plus trunk shows and lots of fun! We'd love to have you join us in March 2019 for one of two weeks quiltin' and cruisin' at sea. For more information, contact our travel agent, Lenore, at cruiselady@tampabay.rr.com. 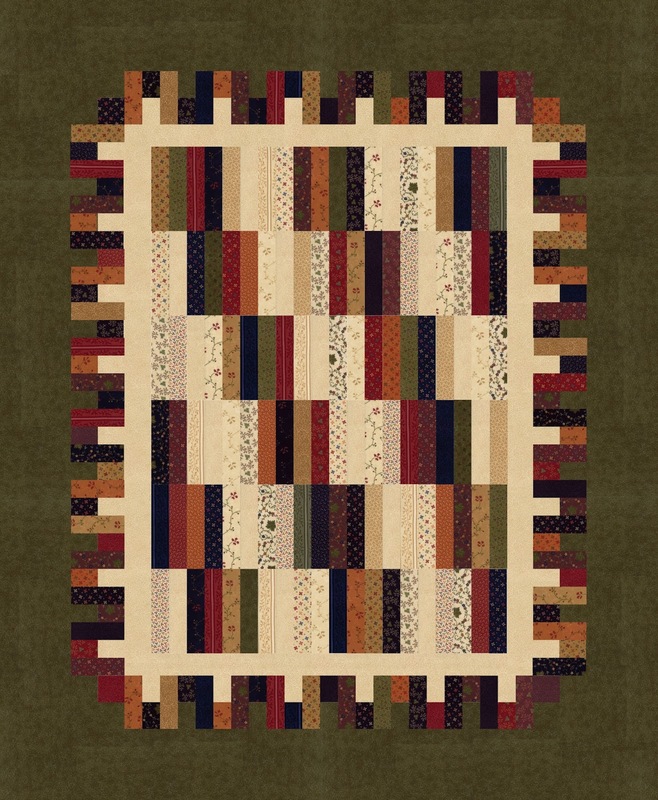 For now, here's what I need from all of you - suggestions for a name for this quilt. Any ideas? I've named about 2 dozen projects in the past few weeks and my brain is fried. The winning submission will win a Nature's Glory Layer Cake, which isn't available until September. Help! 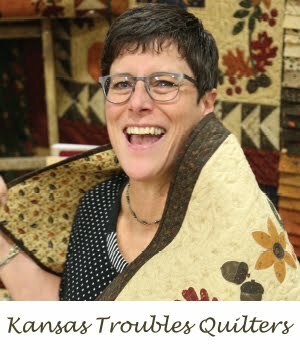 I'm taking over Moda's Instagram for a couple days while they travel to Portland, OR for Spring Quilt Market. I was rather surprised they asked me, since I'm not very tech savvy and don't post to my own IG on a regular basis. But I was up for the challenge, appreciated the opportunity and vowed to up my game with my own social media once this is over. Do you follow your favorite designers on Facebook and/or Instagram? What's your favorite social media site and why? What can you do with a Jelly Roll in just a few hours? 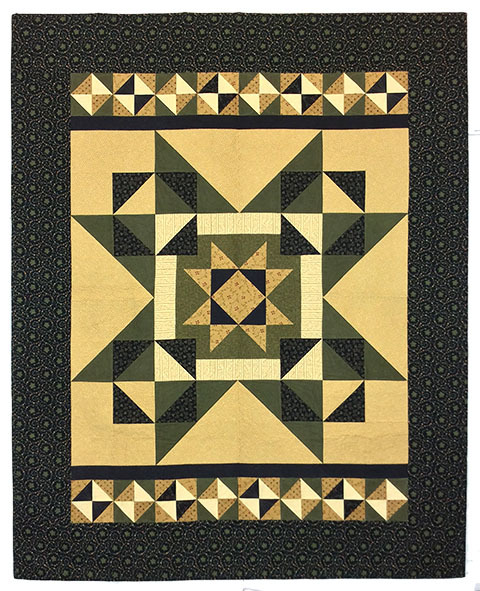 My new Stars on a Roll lap quilt! 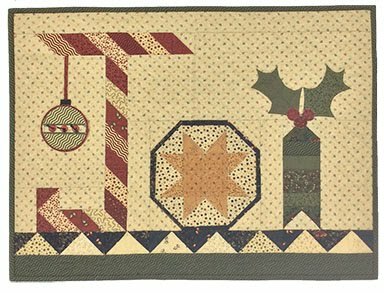 One Jelly Roll plus one border fabric is all you need to whip up a simply starry quilt for anyone on your list. 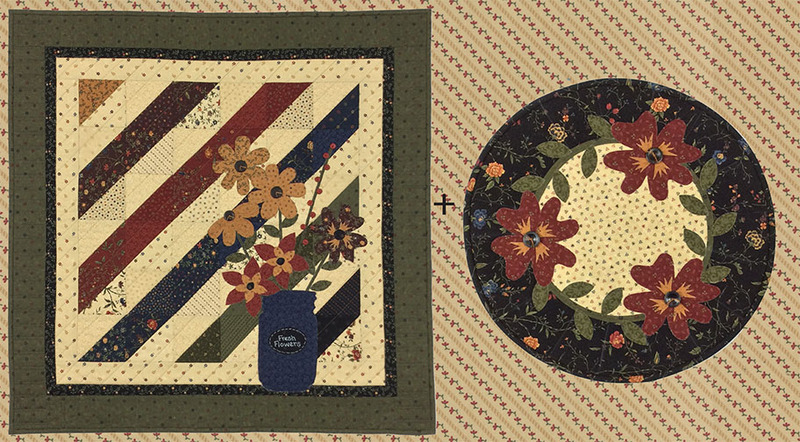 Nature's Glory fabric and projects are available at your favorite quilt shop in September. Congratulations to Lisa in Missouri. 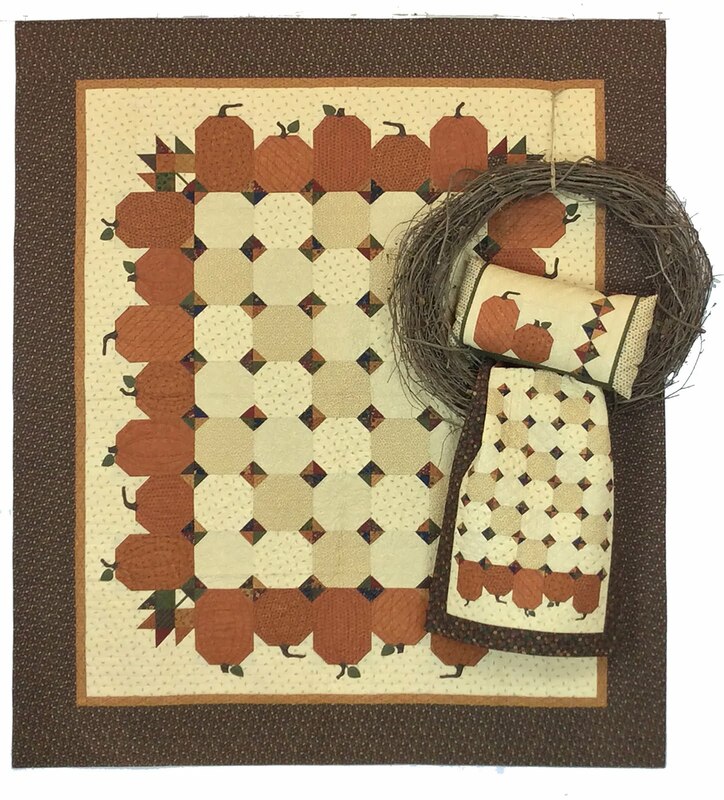 You're the winner of our KT Country Road Flannel bundle. 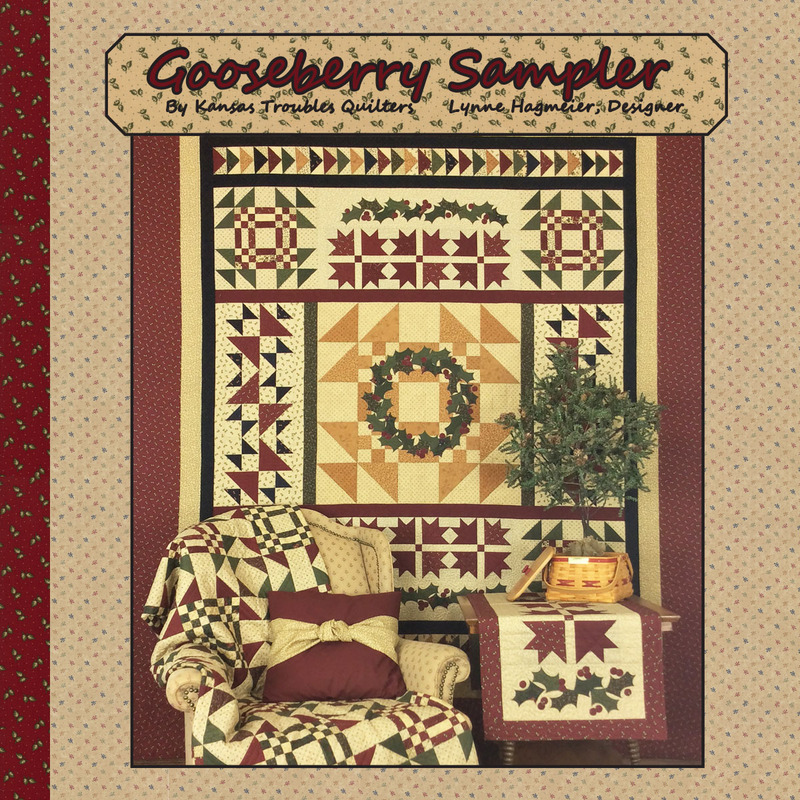 Enjoy a bit of Country Road before it hits the quilt shops in July. Lisa -Love reading the phrase "dirt roads". I still say that when referring to "gravel roads", which is said here in Missouri. 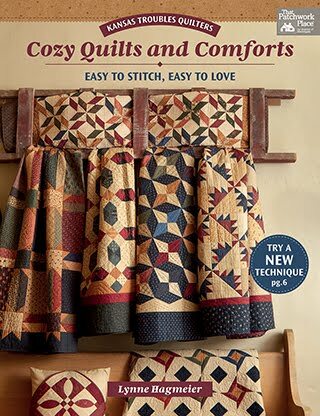 Since I won't be traveling to Portland, OR for Spring Quilt Market, it will be an especially relaxing Mother's Day here. Usually, I'm making last minute preparations for the booth and packing the car. Our family is pretty low key for most holidays, and Mother's Day is no exception. Seldom do we all get together at the same time except for our family summer vacation and the weekend after Christmas. Otherwise, I'm happy to spend time with whomever shows up. My oldest son, Neil, was home last weekend finishing some construction projects for me (woohoo!). We met Brent (twin #1) and family for dinner and then enjoyed Delainey's dance recital Saturday night. Always an entertaining evening. Brian (twin #2) lives in Colorado, so we'll see them next month when we're on vacation. My daughter, Nicole, and grandaughter, Aleece, will be coming for the weekend to hang out, but no big plans. We'll invite my Mom over for a picnic Sunday afternoon, soaking up a little springtime - finally. Guess I better figure out the menu and hit the grocery store soon. 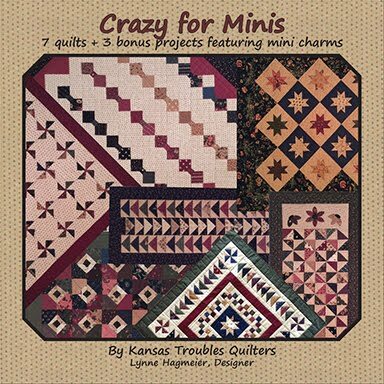 Any suggestions for a quick and easy dinner & dessert for a lazy hostess that can be made while I'm working in the yard and quilting? I hope all of you mothers and grandmothers and aunts and step-moms out there have your perfect kind of day, whatever that may be. Bless you and all that you do for your families and friends all year long. A couple years ago, I painted a Kansas Troubles block to hang on the end of our home. At four feet square, it can be seen from the road a half mile away. 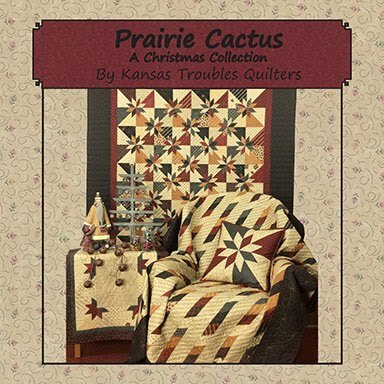 I love it so much, I asked a professional barn quilt painter, Sue Hageman of Manhattan, Kansas, to make one for our KT Quilt Shop, too. 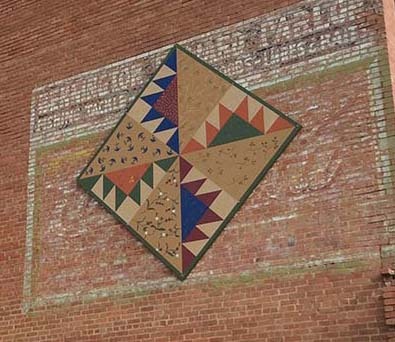 At 8 ft. square, it announces the location of KTQ in a BIG way in our little town. She painted KT fabrics in the blocks, too - isn't that the coolest? Our building was the town's pool hall for years. The Bennington Billard Parlor sign with Coca-Cola beneath it is still visible on the bricks behind the KT block. A combination of past and present. 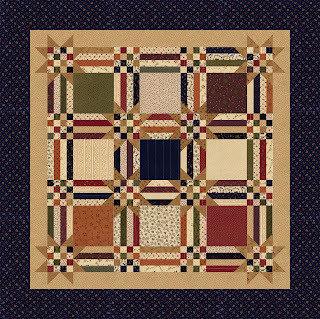 For my new fabric collection, Nature's Glory, I wanted to create a small charm quilt that would look like a barn quilt. 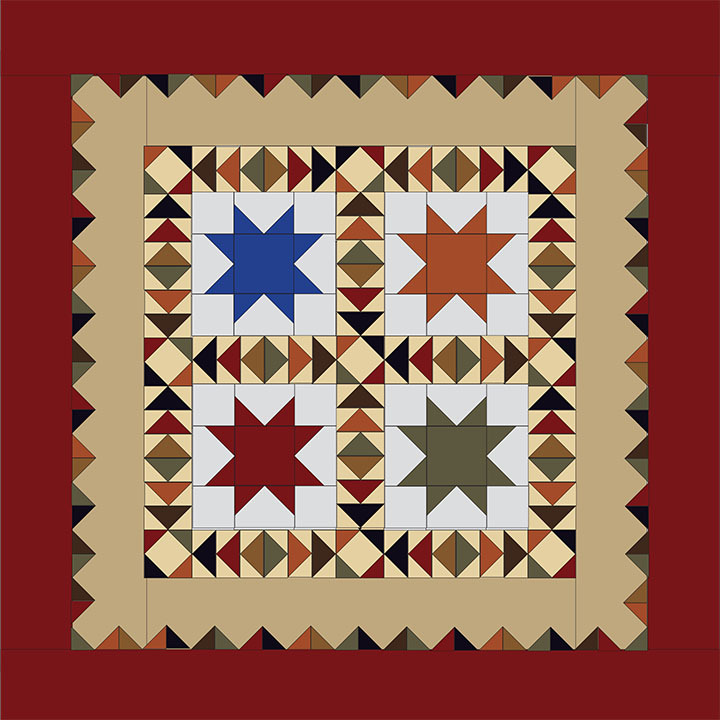 Here's my version of Barn Star. 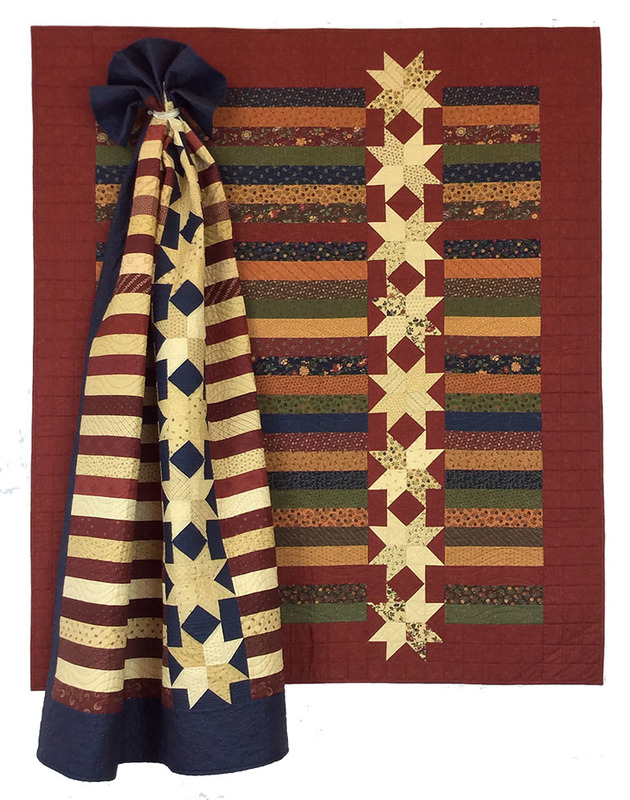 A Nature's Glory charm pack plus 2 tans and the navy border are all you need to complete this fabric version of a barn quilt for the inside of your home. 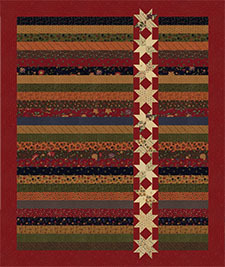 Nature's Glory is being shown to quilt shop owners now and will ship in September. 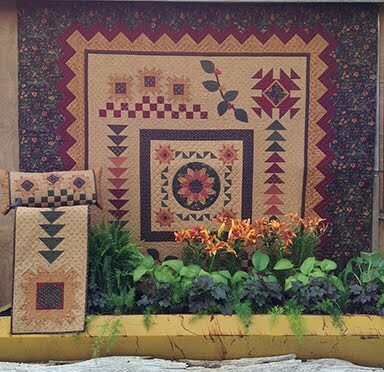 Watch for more projects featuring Nature's Glory in the weeks to come. BONNIE HILL - Love, Love, Love, and want it all. !!! 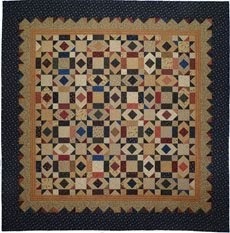 Bonnie, you'll be the first on your block to be able to fondle the new KT Country Road flannels. 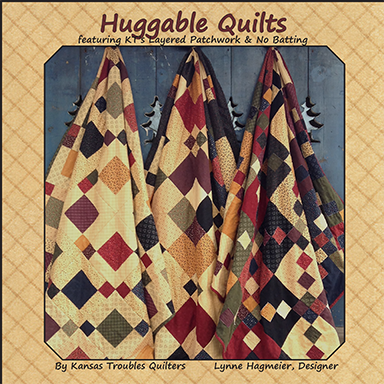 They'll be at your favorite quilt shop in July along with the Flannel Days, Starry Nights booklet, shown last week, and the Country Road booklet, below. Enjoy! It finally feels like spring here in Kansas. Robert and I have been working in the yard, trimming branches, spreading mulch and rearranging the yard art. 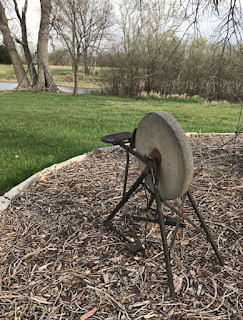 If a rusty piece of junk catches my eye - anything from an old farm tool to a vintage sprinkler, to the top of an old wood burning stove- it can be featured in the garden. 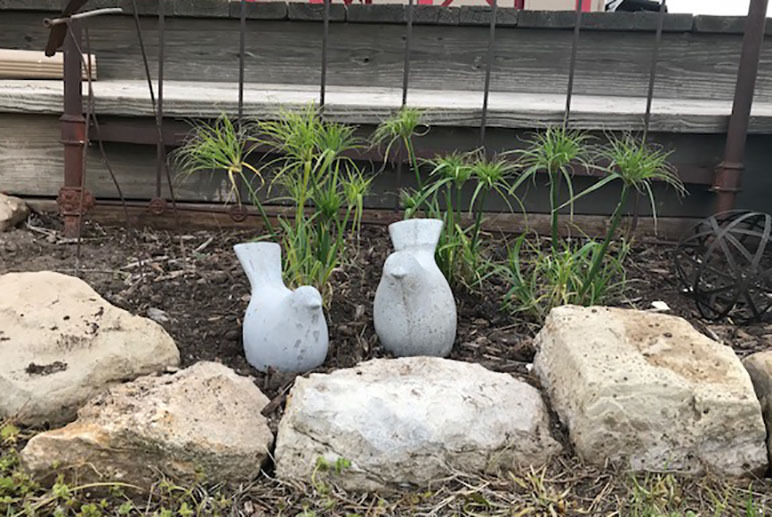 I say garden generously, since we basically plant each year to feed the bunnies and deer, so there are usually a lot of holes in the landscape after just a few weeks. My solution? 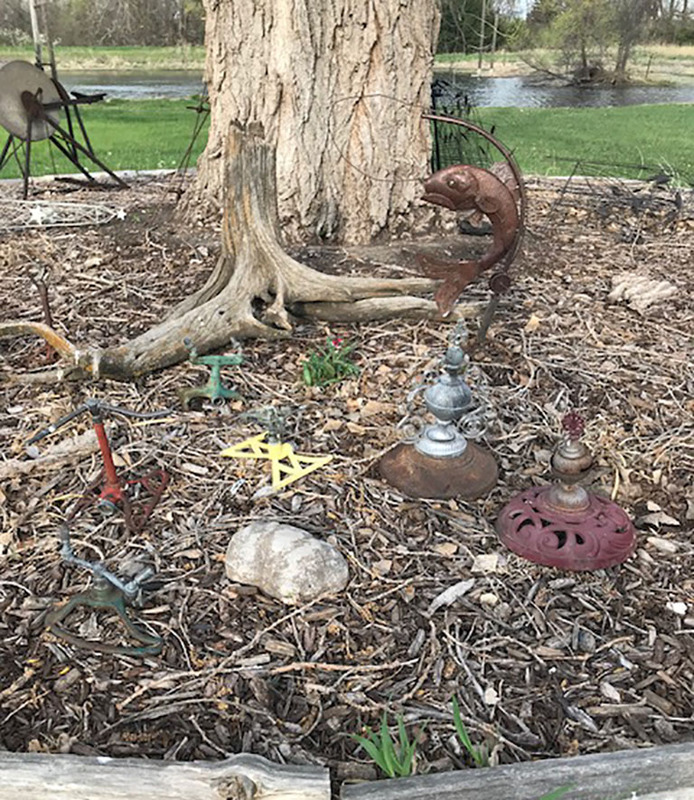 Bring in another piece of yard art! 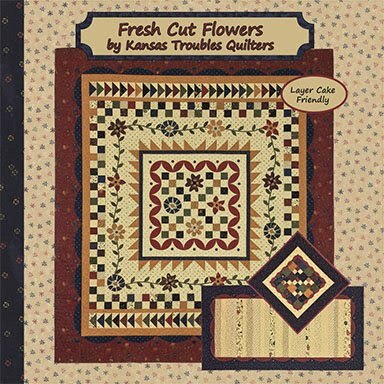 One type of flower that lasts around here is the appliqued kind, like on my U-Pick Flowers charm pattern and Cut Flowers Mini Table Treat. 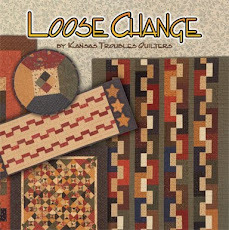 For the month of May, buy the pair of patterns for the price of only one - $6.50 (retail $11.50). That's like buying U-Pick Flowers and getting Cut Flowers FREE! 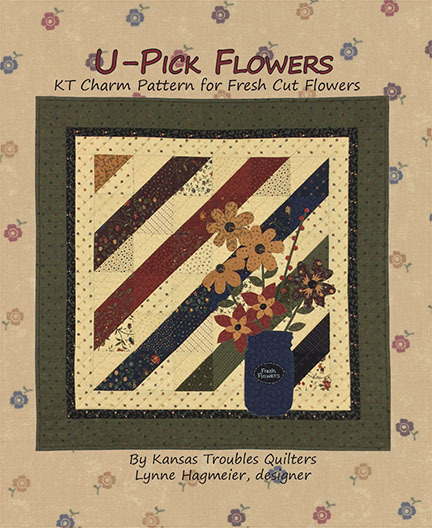 While you're ordering, add the KT Kut-ups for either of these projects to your cart for a quick and easy finish.Click HERE to receive your KT May Special BOGO now! 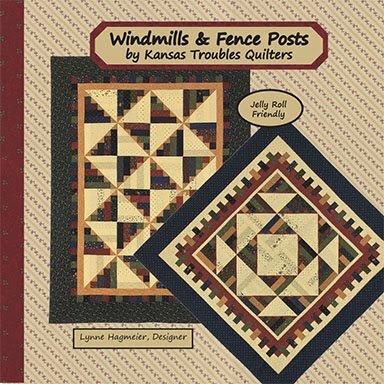 To visit me, you would need to drive a couple miles on a gravel road, then turn at the windmill and continue down a winding lane leading to my house in the country. We're surrounded by wheat fields and pasture on three sides with a pond out my front door. 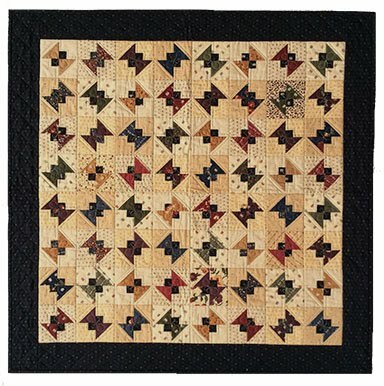 Driving down the dirt roads each day, I envisioned a quilt with roads crossing between fields of golden wheat, bright green soybeans and rich dark tilled soil. 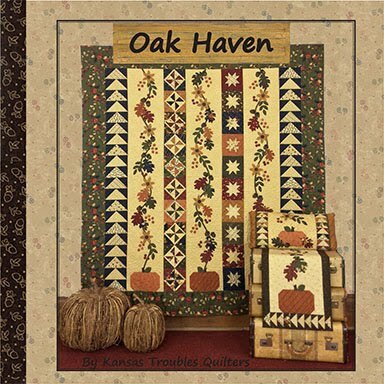 I could see in my mind the crooked path that rambled thru the fields to our cabin. The result? The projects in my Country Road booklet featuring KT Country Road flannels - Crossroads and Rambling Road. 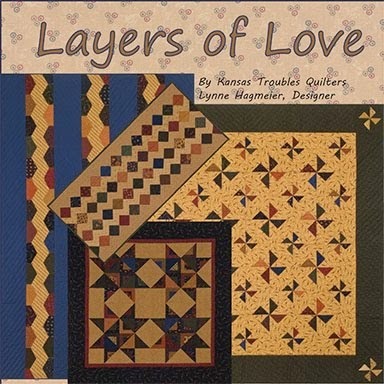 Both quilts start with a Layer Cake to provide lots of yummy scrappiness. 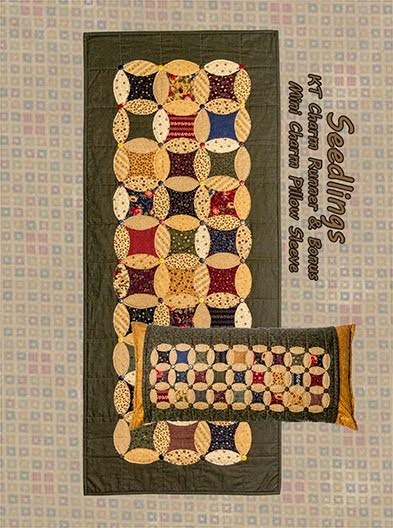 Add a few fabrics for backgrounds and borders for a soft and cozy quilt anyone would love to snuggle in the country - or the city. 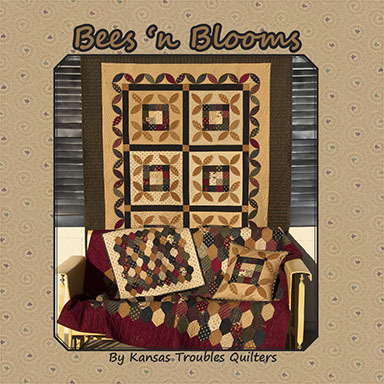 Two patterns in one booklet; also available as queen/king size quilts. 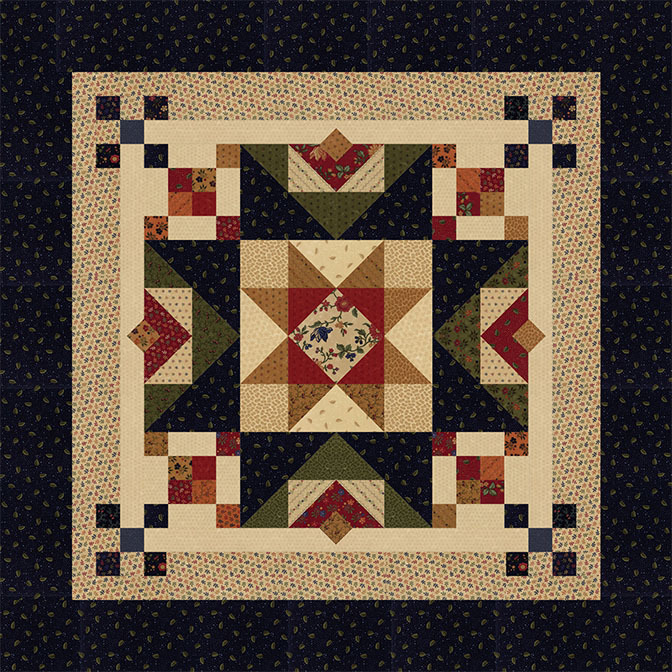 The Country Road flannel collection and booklet will be arriving in quilt shops this July. 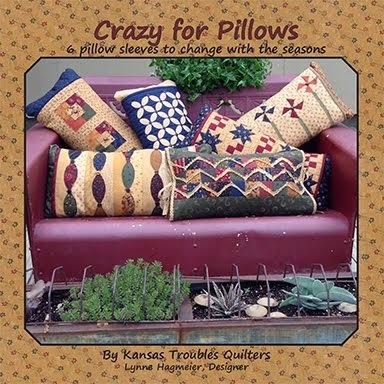 But you can win a bundle of flannels now by commenting here about your favorite gardening decor. Are you a traditional gardener with perfect rows of blooms? Or a free spirit with wildflowers growing impulsively amongst your yard art? I'd love to hear from you.